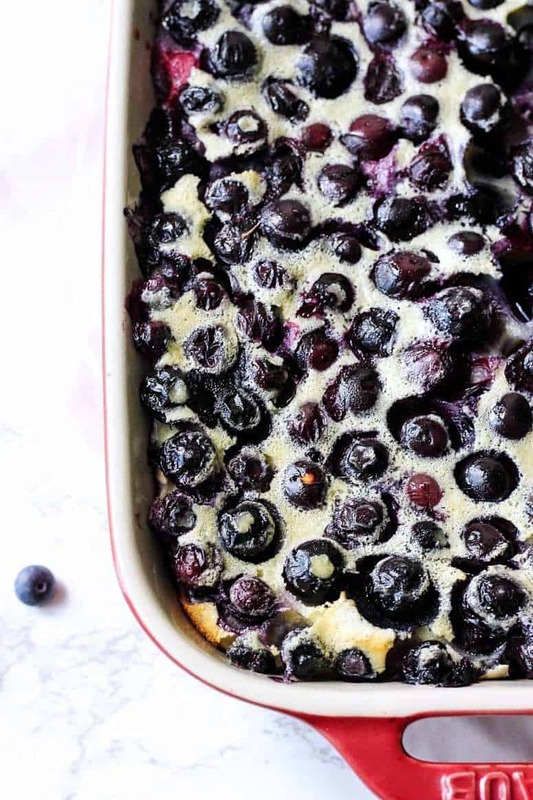 Blueberry Clafoutis is a fast dessert that is easy on the eyes and chock-full of fresh blueberries. I officially have the best neighbors. A few weeks ago on my way to pick up my older daughter from preschool, my Korean friend from the community where I live, came to me and gave me a whole box of freshly picked blueberries. It’s a blueberry season after all. Since there were a lot of blueberries, I thought that a simple and easy blueberry dessert might be a good after dinner treat for my family. As you already know, I’m obsessed with French food. Whenever I see an easy French recipe, I immediately start making it. Take this recent recipe of Mustard Chicken. So good!! Anyways, after the birth of my second daughter, I rarely have much time for complicated recipes. So after I skimmed through the Internet, I found a great and easy French recipe to use up our blueberries. Clafoutis is a light fruit custardy dessert, usually made with cherries. But, in fact, you can make it with whatever fruits or berries you have. 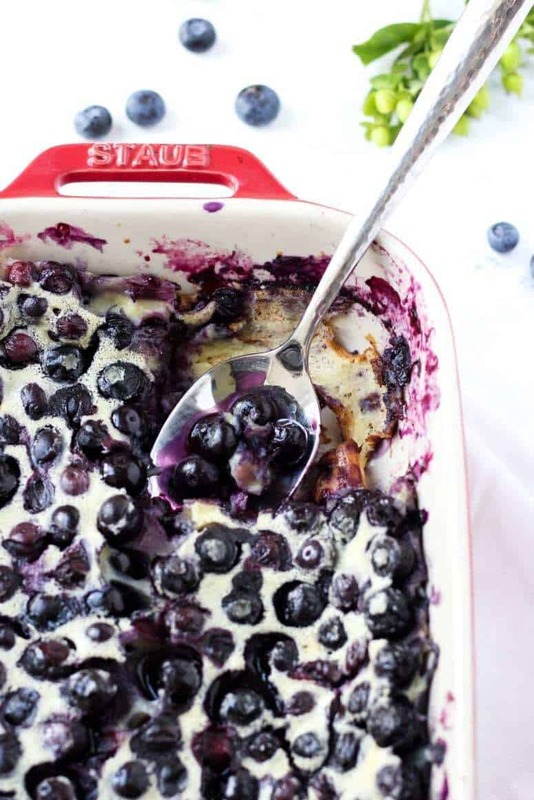 We happened to have fresh blueberries and they worked perfectly in this dessert. If you have other berries, feel free to use them. The recipe is so simple. Just mix everything in a standing blender and the batter is ready. I love it. No need to clean a pile of dirty dishes afterwards. 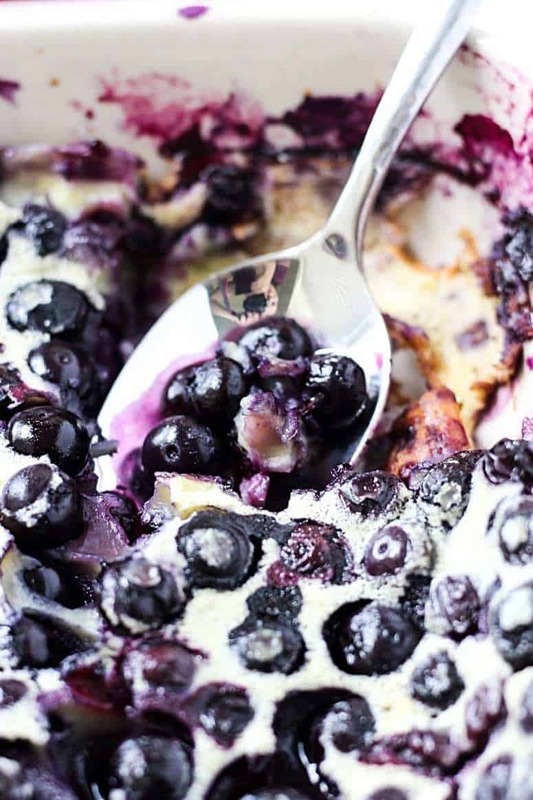 This blueberry clafoutis comes out very puffy, soft and juicy. The batter resembles the one used to make pancakes and if you love pancakes, you’ll fall in love with this easy rustic dessert. In a bowl of a standing mixer, combine milk, ⅓ cup of sugar, eggs, vanilla, salt and flour. Blend until the mixture is smooth and frothy. Lightly grease 8*8 baking dish with butter and pour a ¼ inch layer of the batter. Place it in the oven and let the batter set for about 5 minutes until a film of batter forms on top of it. Remove from the oven, spread blueberries and then the remaining sugar on top of the batter. Pour on the remaining batter and smooth with the back of a wooden spoon. It was amazing! And simple. Thank you. Followed exact recipe provided. Kids loved it too. Thanks for your comment Lisa! I’m so glad you and you family liked the recipe! I now make this recipe regularly. It is so easy but looks and tastes as though it would take real skill to put together. I use whatever berries I have on hand and/or are in season. It is equally good with all. Hi Diane! I’m so glad you like this recipe! I agree, it is one of the easiest French dessert recipes. Surprisingly, I’ve made Clafoutis with blueberries only, but I definitely should try to make it with other fruits and berries as well. This looks so good! And simple to make too. This looks delicious! And it’s so pretty, too!